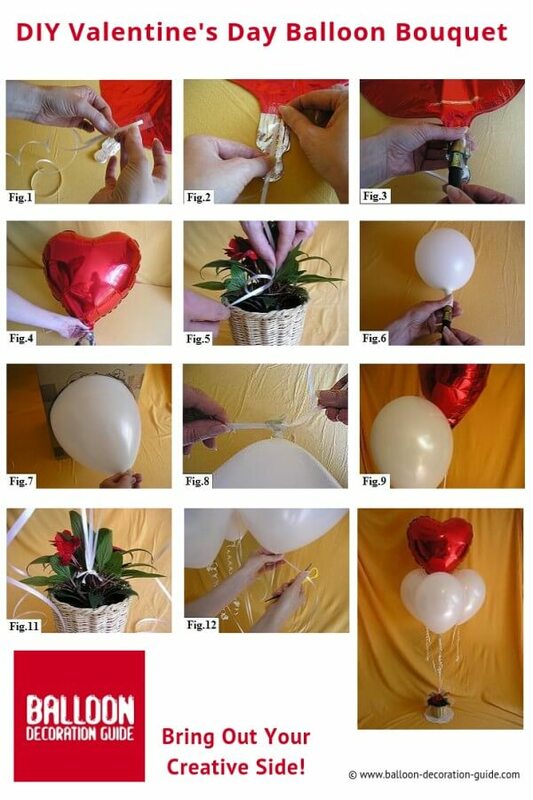 Created in six easy steps, this Valentine Balloon Bouquet is one of the best personalized Valentine's Day gifts you can give to that special someone. The hunt for unique and original gifts for Valentines is finally over! 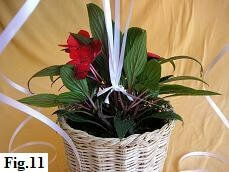 You can't give the same bunch of flowers or box of chocolates year after year, can you? Take 150cm length of white curling ribbon. Measure 100cm and at that point fold it back over on itself, leaving the remaining 50cm for curling. 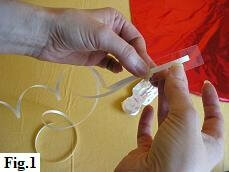 Take 5cm of sticky tape and apply it to the folded section of ribbon (fig. 1). 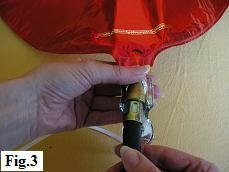 Carefully attach it to the neck of the heart balloon, on the opposite side to the self-sealing filling valve (fig. 2). OK, let's start blowing up the balloon with helium. 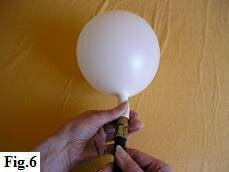 Gently insert the nozzle of your 'filling station valve' into the opening of the balloon self sealing valve (fig. 3). As you do this, take care not to use too much force in case you tear the mylar. 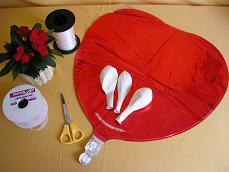 Keeping a firm grip with your thumb and index finger, begin inflating the balloon. The type of valve we are using here is commonly called a 'Quick Fill Station'. It works simply by applying downward pressure to the black flexible section. If you've never used one of these before, press it down very gently so that you get a slow, controlled release of the gas. 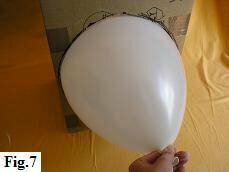 Continue to blow up the balloon until it begins to feel firm (fig. 4). 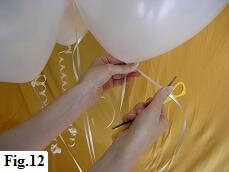 Tie the balloon ribbon to the nylon line of your pre-prepared base with two securing knots (fig. 5). The height of the heart should be roughly 80cm to 100cm. 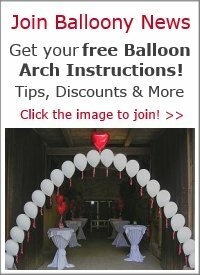 Take the first of your white latex balloons, slip its neck gently over the valve of your 'filling station' and begin inflating (fig. 6). 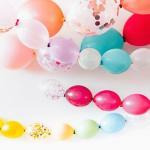 When the balloon is filled approximately to its optimal size, check it using your balloon sizer (fig. 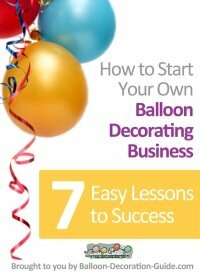 7) and inflate or deflate as required. When the balloon is the correct size then you tie a knot. 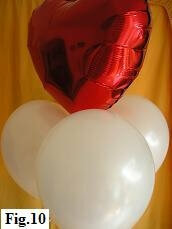 Check out our "Tips & Tricks" for an easy and quick way make a balloon knot. Cut about 1.5 m of ribbon. Leaving half a meter spare, tie it in front of the balloon knot (fig. 8). Tie a second knot to attach the ribbon securely. 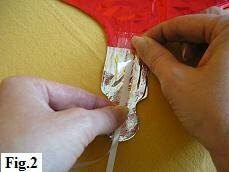 Pass the other end of the ribbon under the nylon line on your base. 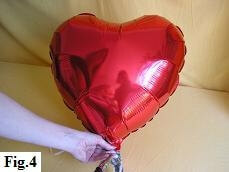 Adjust the height of the latex balloon until it is just touching the underside of the mylar heart (fig. 9). 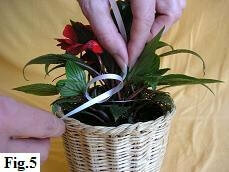 When you're happy with the positioning, tie the ribbon to the base with two securing knots. Repeat steps 4 and 5 for the remaining two balloons. 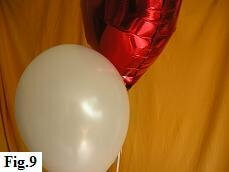 When finished, the three latex balloons should be sitting at an even height (fig. 10). Your masterpiece is almost complete. So, let's move on to the finishing touches. We need to tidy up the curling ribbon on the base. So take your scissors and trim the excess as close to the knots as possible (fig. 11). 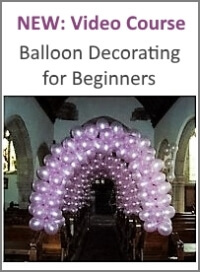 Next, curl the loose ends of the ribbons at the balloons. To do this you take an open pair of scissors. Starting at the knotted end, place the ribbon between your thumb and the blade edge and then pull the scissors down the entire length of the ribbon. Try not to grip too tightly as you'll make the curls too tight (fig. 12). 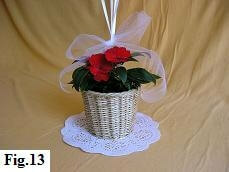 Take about 60cm length of white tulle and tie a decorative bow around the ribbons just above the plant (fig. 13). 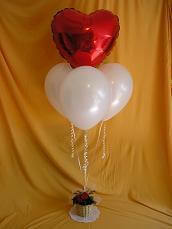 To add a final delicate touch, place your balloon bouquet on a doylie as shown in our example. That's it! Congratulations on having created one of the best Valentines gifts for women you can find.